The other day I whipped up another batch of homemade Turtles. They didn't last long. I'm trying really hard to not make another batch. I don't want to start making these on a regular basis as I'm pretty sure my waistline won't approve of consuming so many of these. But man, are they so freakin' yummy! And judging from how quickly they were gobbled up at Brett's company BBQ, I'd say that they're quite the crowd pleaser too. With school starting soon, and the holidays just around the corner, I thought I would share the recipe (although I'm sure you could just Google it without me blogging about it). I'm thinking placed in a pretty (food safe) container and it would make for a nummy hostess, teacher, or last-minute gift. I think they'd be a great addition to a school bake sale (but make sure offering nuts are allowed!!) or even the dessert table at the next get-together. Or you could just make a batch and hoard them for yourself. I won't tell. I just might do that the next time I make these. 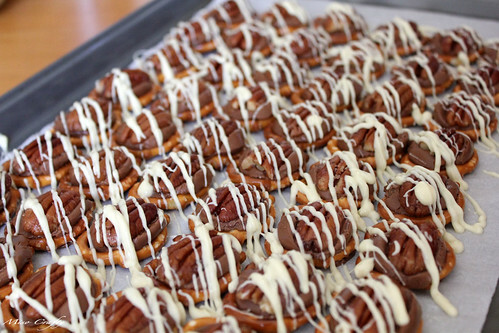 You can make however many you want, just make sure that you have equal amounts of pretzels, Rolos, and pecans. Now, you can bypass the toasting of the pecans but I will put it out there that toasting them definitely makes the pecans go from "meh" to "oh yeah, baby!". 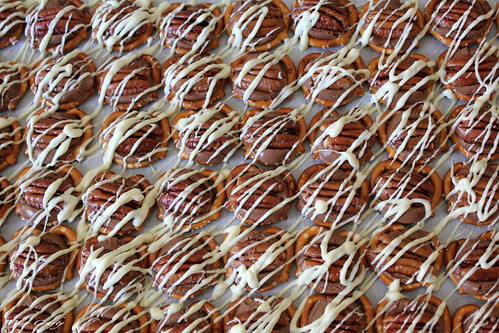 Want to step it up a notch and make those pecans extraordinary? 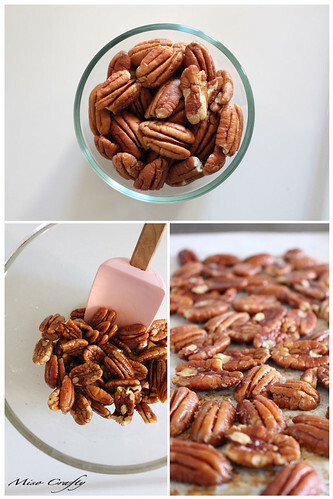 Toss those bad boys in some melted butter (for 40 pecans I used about a tablespoon of butter) 'til evenly coated, spread in a single layer on a baking sheet lined with parchment paper, and bake in a 350 degree oven for 5-7 minutes until aromatic. Let cool. Seriously, toasting the pecans in butter they make quite a difference. Like my friend Jennifer says, everything is better with butter! Ok, so while those boyos are cooling down turn down the heat of the oven to 300 degrees and then arrange the pretzels in a single layer on another baking sheet lined with parchment paper. 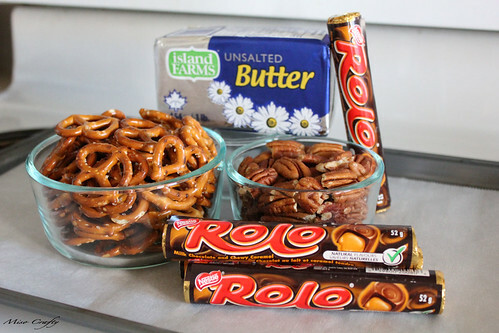 Place a Rolo (or whatever substitute that you're using) on each pretzel and bake for 4 minutes. Just a heads up: the Rolos aren't going to look like a melted mess of goo when you take them out of the oven. If anything they look a little glossy. Don't be fooled by this and think you need to stick them back in the oven to melt them some more. 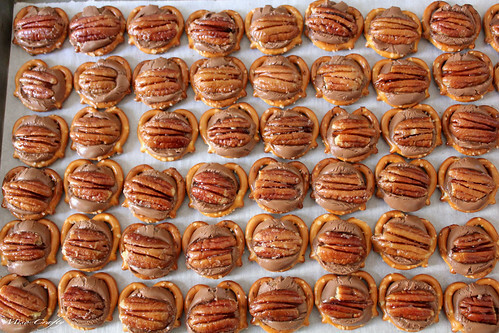 While the Rolos are still warm, quickly press a pecan half into the Rolo. 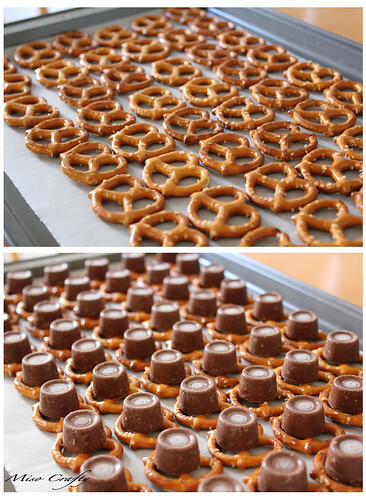 You don't have to squish it down all the way, just enough so that the Rolo will spread out a bit and cover the pretzel. Let these yummy morsels cool completely. Now you can leave them like this and they will still be mighty tasty. But c'mon. Look at them. They look boring! They'll never catch anyone's eye, especially if they're surrounded by cupcakes, crumbles, and cakes! Hells no! Time to bring out the big guns and give these some pizzazz! Ooohhh yeah. Now we're talking. Melt some white chocolate in a double boiler and using a pastry bag (or in my case a small Ziplock bag with a corner snipped) drizzle the chocolate all over. Then let cool completely before storing in an air-tight container. So now who's going to be everybody's favourite person for the next 15 minutes?? That's right honey. You are! Make sure you save a few for yourself. I forgot to do that for the BBQ (mind you, I was running late) and only got to snag a few before they were snatched up by everyone else. These are SO insanely good with a nice cup of coffee...during your little one's nap...while you take a moment to knit. Mmmmm...pure heaven, right there! I have never heard of these before but they look delicious! Thanks for sharing. I still have yet to try there - perhaps for the next party/function Ry and I attend!